While teaching a course on Islam at Korntal (German branch of Columbia International University) last month, I went to Dachau, ten miles northwest of Munich. It was the first of many Nazi POW camps, built in 1933, and a model for all other camps. Fear and dread of Dachau was so great people prayed to escape its horrors: “Dear God, make me dumb that I may not to Dachau come.” On April 29, 1945, US soldiers freed 32,000 malnourished inmates (Slavs, political prisoners of many nationalities, criminals, gypsies, Jews, homosexuals, mentally ill and others). Only God only knows how many perished through disease, malnutrition, execution and suicide. Incriminating images show that Hitler took sadistic delight in torturing people. 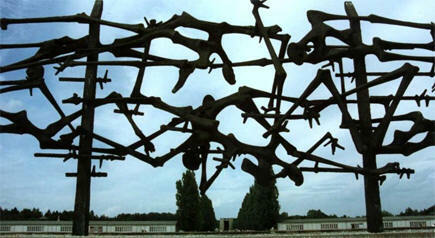 One scene (left) is a huge memorial sculpture in memory of those who died on the high voltage fence surrounding the camp, either through suicide or in trying to escape. I left Dachau with two sobering questions: Where was the church and could anything like that happen in our context? Historically it was a harrowing time and conditions in Europe paved the way for the rise of a dictator. Germany was at an all-time low. She had been forced to accept blame for Allied losses in WWI, and the 1919 Treaty of Versailles imposed reparations she could not possibly repay. The Dutch Mark had fallen, unemployment skyrocketed, and the Great Depression gave Hitler the chance he wanted. In 1933 with only thirty-seven percent of the vote he seized control. Through deceit, back-room deals and demonic influence he swept democracy aside. He controlled crime, built roads, improved the economy and restored national honor. For such amazing success he was basically worshiped. Even most Christians (Protestant and Catholic) adopted Nazi ideology, and buckled under governmental pressure. The most powerful and radical opponent of Nazism, however, was Dietrich Bonheoffer. Unlike most (including pastors), he foresaw the evil early on and railed against it: “Silence in the face of evil is itself evil. God will not hold us guiltless. Not to speak is to speak. Not to act is to act.” In 1939 he made the heart-wrenching decision to leave the safety of America and certain death in Germany. For conspiring to assassinate Hitler and trying to save an entire nation from the monstrous evil of Nazism he was arrested in 1943, and executed at the Flossenburg POW camp, April 9, 1945. It was twenty-three days before the Nazi surrender and only one week before Hitler committed suicide. Bonheoffer demonstrated the high cost of discipleship and he did so with joy and indomitable courage. America also faces threats and it is usually assumed these will come from the outside. For the last ten years the threat of Islam has dominated our thinking and apocalyptic literature has perpetuated this fear. For instance, From 9/11 to 666: the Convergence of Current Events, Biblical Prophecy and the Vision of Islam purports to “… Prepare the church for the fulfillment of these awful prophecies.” The author predicts the Antichrist will be a Muslim and dates are even set for the Beast’s appearance, describing in dramatic detail what life will soon be like in the United States under Islam’s tyranny. The Anti-Christ is indeed coming but we must not make wild predictions as to his identity. What we can say is that he will be given power over “all inhabitants of the earth” and widely worshiped to a far greater degree than Hitler could have imagined. He will control all business and any who refuse to do his bidding will be killed (Daniel 8:24; Revelation 13:3, 8, 16-17). Closer to home, Bonheoffer admired some things about American Christianity, but warned of secularism. Who can deny the prophetic truth of his words seventy years ago? The lesson from Dachau is that we acknowledge our own propensity for evil and tendency to follow the crowd. Current voices extol the glories of America’s past and desire to embrace an even greater future. We too must avoid unshackled nationalism and pride in our political, economic and military accomplishments. Moral decline, half-hearted commitment and failure to live out the gospel threaten us the most. The greatest danger is within. Benz, Wolfgang and Barbara Distel, Eds., 2002. Dachau and the Nazi Terror 1933-1945, Vol. II Studies and Reports). Dacha: Verlag Dachauer Hefte. Bonheoffer, Dietrich, 1937. The cost of Discipleship. New York: Macmillan Publishing Company. Lutzer, Erwin W., 1995, Hitler’s Cross: The Revealing Story of how the Cross of Christ was used as a Symbol of the Nazi Agenda. Chicago: Moody Press. Metaxas, Eric, 2010. Bonheoffer: Pastor, Martyr, Prophet, Spy: A Righteous Gentile vs. the Third Reich. Nashville, Dallas, Mexico City: Thomas Nelson.